The planet as seen in the ending cutscene of Pikmin 2. Areas resembling Australia, southeastern Asia, and Japan are clearly visible. PNF-404 is the planet that Olimar lands on in both Pikmin and Pikmin 2, and where Alph, Brittany and Charlie land on in Pikmin 3. It is the natural habitat of the Pikmin, as well as many other lifeforms, many of them predators of the Pikmin. In the first two games, the planet lacked a proper official name and was often referred to as the "Planet of the Pikmin" or the "Pikmin Planet". The inhabitants of Koppai named the planet PNF-404 when they discovered it in Pikmin 3. In the Super Smash Bros. series, it is known as "Distant Planet". In the first Pikmin game, Olimar crash lands on this uncharted planet during his vacation after his ship is struck by an asteroid. Due to the planet's atmosphere being filled with oxygen, which is toxic to Olimar and his people, he must escape the planet before his life support system fails. In Pikmin 2, Olimar returns to the planet with his new companion, Louie, in search of treasure, in order to rescue the company he works for, Hocotate Freight, from bankruptcy. 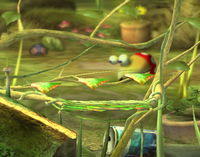 In Pikmin 3, the inhabitants of Koppai discover the planet in an attempt to find food on other planets and name it PNF-404. They send Alph, Brittany, and Captain Charlie to the planet to bring back food, in order to save their planet from starvation. A generic area of the planet appears in Super Smash Bros. Brawl and Super Smash Bros. for Nintendo 3DS as a fighting stage under the name Distant Planet. It features a forest-like location, similar to The Forest of Hope or the Awakening Wood. Although ambiguous, PNF-404 is at least very Earth-like, with similar geography and traits. Whether PNF-404 is actually our Earth or an alternate version is yet to be revealed in the games or by Shigeru Miyamoto, the game's creator. Either way, it is doubtful that the similarities are coincidental. Many of the environments and climates of the areas on PNF-404 resemble terrain on Earth. The areas in the games contain environments that can be found similarly on Earth: forests, rivers, wastelands and tundras are just some of the examples. Most of the vegetable lifeforms on PNF-404 also exist on Earth, with some even sharing the names we are familiar with. Most of the charted plants in Pikmin 2 are like this, but some of the background shrubbery is also quite similar to fauna and flora found on Earth. Some of the Pikmin 2 treasures and all of the Pikmin 3 fruits are also objects that exist on Earth, and are described to be much like the ones on our planet. In the first game, Olimar stated that the atmosphere is composed of oxygen, a component of the air that humans need to breathe, but also an extremely toxic gas to the people of Hocotate. Despite the fact that no moon is ever seen orbiting the planet in either Pikmin or Pikmin 2, Olimar confirms in one of his voyage logs that the planet does in fact have a "pale white moon". It can be seen in the Pikmin 3 intro cutscene. Some of the elements found in PNF-404 appear to not be natural, but rather, made by sentient beings. Drawing the parallel with Earth, these objects are very likely made by humans. Tin cans, as well as many other human-made objects and structures from modern times, can be found lying around (for example, parts of Perplexing Pool appear to be the remains of a bathroom, and a Ramune bottle in The Forest Navel), and most of the "treasures" found in the second game are human-made. Nearly all of the treasures in Pikmin 2 and every treasure in Hey! Pikmin are artificial. These even include many items that are registered trademarks of companies on Earth, such as Duracell and 7-Up. Although treasures are absent in the third game, there are still some objects made by humans scattered across the areas. Although Tropical Wilds is nearly all natural, lots of human-made objects can be found in the Garden of Hope. There are many cinder blocks blocking paths, and some pipes near the southern half, which appears to be the remnants of a bathroom. The whole stage obviously has many flower pots and garden elements, and there is a jump-rope near the entrance to the Quaggled Mireclops's arena. More rusted cans can be found in Distant Tundra, as well as light bulbs and a car battery. There is also a large tomato can in Twilight River near the Puffy Blowhog. Finally, the Data Glutton and Folded Data Glutton are obviously phones made by humans, and the S.S. Drake even calls it an "ancient communication device". Various obstacles also appear to be made by humans. These include cardboard boxes, paper bags, tin boxes, seesaw blocks, elevator platforms, reinforced walls, dirt walls, electric gates, brick walls, and iron balls. Alph actually comments on a dirt wall saying that it seems to be a "sign of intelligent life," heavily hinting that it was built by humans, which may explain its sandcastle-like shape. There are many different creatures to what we know at the present day. Perhaps this is an entirely new age where humans have died out and many other creatures have come to coexist. The Geiger Counter is constantly in action, implying that there is strong and constant radiation. That could explain why there are no humans any more, and also why all creatures on PNF-404 look so different compared to how animals looked when humans were alive. In the first two games, PNF-404 is made out to look like present-day Earth. From space, PNF-404's geography appears to match that of Earth's, and the second game more clearly proves this, as when Olimar lands on or leaves the planet, his ship is shown to be heading towards or coming from Africa. The Hocotate ship even states at the time of the discovery of the Spherical Atlas that it exhibits PNF-404's geography as seen from space: both this and the Geographic Projection are two halves to a globe that clearly shows Earth and its countries. Pikmin 3 seems to retcon that in favor of an entirely new look, with it being heavily based off of scientific hypotheses of how the Earth's surface would look like in 250 million years, known as Pangaea Ultima. Almost all of the game's levels are more composed of natural elements rather than man-made remnants, and the small amounts of evidence of humanity left are heavily deteriorated, more-so than in the earlier games, to justify that it has been millions of years after humanity. All of the fruits in the game are based on real fruit, however, many of them are found in places where they wouldn't be able to grow, or with other fruit that they aren't grown near. Internally, in Pikmin 3, the files for the area selection monitor call the view "Pangaea Ultima" (Pangaeaultima_a.gtx, for instance). 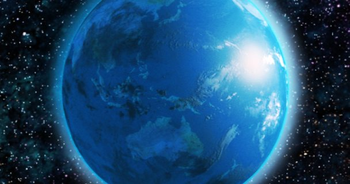 Similarly, in Super Smash Bros. Brawl, the Distant Planet stage is referred to by the name "Earth" (STGEARTH, more precisely). These names were only used between developers, and likely used as placeholders, but it makes it clear that the developers see the planet as Earth. On Nintendo Power issue #278, it is revealed the editors believe that the planet is Earth. The canon and affirmation of this statement is up for debate, however. In the Super Smash Bros. series, PNF-404 appears as a stage known as "Distant Planet". This article or section is a short summary on the Smash Bros. stage. In Super Smash Bros. Brawl Super Smash Bros. for Nintendo 3DS, and Super Smash Bros. Ultimate, there is a stage named Distant Planet. It features a background similar to the Awakening Wood, while the foreground is consisted of some vines, leaves and a slope. A Red Bulborb occasionally appears on the right side of the screen, which can be stood on. It may open its mouth, and any fighters that fall in are eaten and lose a stock. Another Red Bulborb is found in the background sleeping, but never wakes up. An Onion of a random color drops from the sky at times. Pellet Posies also grow at certain times, and, if hit enough, they'll drop their pellet. If the fighters grab a pellet and throw it at an Onion, items will spawn from it, with the amount depending on the pellet's number (leaving a Pellet Posy alone slowly upgrades it from a 1 to a 5 and then 10) and whether it matches the Onion's color. Damaging an Onion enough will cause it to fly away prematurely. As with many Smash Bros. stages, a few liberties have been taken from the original source. Firstly, rain pours from time to time, which does not occur in the Pikmin series until Pikmin 3. Secondly, decorative content such as a Super Smash Bros.-themed soda has been added. Finally, the Red Bulborb is much larger in Brawl than in the Pikmin games, at about four or five times the size. Super Smash Bros. for Wii U also contains a stage from an area in PNF-404. This one is titled exactly the same as the Garden of Hope, and is much more faithful to the actual game area than the arena in the previous games. The name "PNF-404" fits the nomenclature used by NASA to identify less important planets. The letters and numbers that make up the name, however, have a special meaning: 404 is an HTTP status code that means "Page Not Found". The planet as seen in Pikmin. The planet as seen in the Pikmin 2 intro cut-scene. The Hocotate ship's engine glows over what appears to be somewhere in Africa as it lands. PNF-404, as seen in the Nintendo Player's Guide of Pikmin. The planet as seen on the log screen in Pikmin 3. A GIF showing the correlation between PNF-404 and Pangaea Ultima, what Earth is predicted to look like 250 millions years from now. The planet as seen in Pikmin 3. Texture used for the planet on the area selection screen. “It's inconceivable that such an immense object has been buried here for so long. The design on the outer shell resembles the surface of the planet as seen from space! Perhaps this can be used for something other than salvage. But how will we ever lift it? I fear that even 100 red Pikmin will be unable to lift it! ...Error. I could only decode a portion of the data, but I did retrieve new geographic charts. I will input this data into my planetary database and name it the Sphere Chart. Press START/PAUSE to contact me and access the Exploration Kit on the radar screen with L.
This article was a featured article from August 18th to March 24th, 2010.